Boyle asks you to think back 17 years and imagine that you knew nothing of the World Wide Web or its many applications and services. If you saw the major arguments pro and con, would you have green-lighted the open web, open source software, or Wikipedia? My point is simple. We have a bias, a cognitive filter, that causes us to underestimate the benefits and overestimate the dangers of openness � call it cultural agoraphobia. And herein lies the lesson for the Obama administration. Think about the policy choices of the future by applying our assumptions to the choices of our past. Comment. This is a real phenomenon and "cultural agoraphobia" is a good term for it. I run across this systematic cognitive bias every day, in myself and others, even after 17 years of experience with the open web. Of course not every objection to openness is an example of cognitive bias. So the term will be more useful for anthropologists studying our culture, or historians looking back, than for advocates and activists. We still have to answer objections, not just explain them. But Boyle points out an important use for advocates and activists. If we understand cultural agoraphobia, we can warn policy-makers, the citizens who watch them, and ourselves, against its effects. Posted by Peter Suber at 2/07/2009 03:49:00 PM. You've mentioned the 'Open Access' movement as one current trend about which you'd especially like to get input from the Skidmore community. How would you describe the movement and what challenges and opportunities does it pose to academic libraries? In the 1980s, college administrators expressed concern that they were buying back the scholarly output of their faculty --- output they had already paid for with salaries, infrastructure, and staff. Librarians, faced with a 215 percent price increase in journals from 1986 through 2001, were forced to begin cancelling subscriptions. This created a groundswell of interest in the concept of Open Access, a movement to place peer reviewed scholarly literature on the Internet, making it available without cost and free of most copyright and licensing restrictions. In 2007 the Senate Appropriations Committee directed the NIH to require that its funded research be made publically available on the Internet within 12 months of publication. The movement gained further momentum last February when the Harvard Faculty of Arts and Sciences voted to give the University a worldwide license to make each faculty member's scholarly articles available in a central database administered by the Harvard University Library. Would you like to see the Skidmore faculty take a similar move as the Harvard faculty? What would this mean for Skidmore? Posted by Peter Suber at 2/07/2009 03:05:00 PM. � Basic geographic data such as electoral and administrative boundaries, the location of public buildings, etc should be available free of charge to all. � There should be simple, free access to general mapping and address data for volumes of data up to moderately substantial levels. � Voluntary and community organisations pursuing public policy objects should benefit from straightforward standard provisions for ensuring access to geospatial data without constraints. PS: Also see our past posts on the Show Us a Better Way contest and the Power of Information Review, the predecessor to the current report. Update (2/9/09). Also see the comments of Tom Watson ("A Blueprint for Obama?") and Ellen Miller. Posted by Peter Suber at 2/07/2009 02:52:00 PM. Data republished by the government that has been received or stored in a machine-readable format (such as online regulatory filings) should preserve the machine-readability of that data. Update (2/10/09). More from the ACM: Make Recovery.Gov Web 2.0 Friendly. ...Today we turn our attention to an obscure requirement of [The American Recovery and Reinvestment Act], which requires a website called �Recovery.gov� to house all of the grant data that would be generated from spending under the act. USACM sent a letter calling for the website�s requirements to include the ability to download complete data sets in machine-readable form. Posted by Peter Suber at 2/07/2009 01:52:00 PM. Sarah Shreeves: What Are Our Success Factors? Posted by Gavin Baker at 2/06/2009 06:17:00 PM. Gavin Baker, Authors: I don�t care where you deposit, just do it, A Journal of Insignificant Inquiry , February 5, 2009. If requiring deposit is left to universities, their repositories will only contain publications by their researchers. Since some researchers have multiple institutional affiliations, and since any given publication may be authored by researchers across multiple institutions, it is easy to see that researchers will ultimately have to deposit their publications in as many repositories as there are institutions involved in their research. This trend seems to rest on the naive notion that, in the Internet era, it is somehow still necessary for researchers to conduct their work solely through the channels of a university. It is understandable that universities may wish to host a complete collection of the research published by their faculty, but nowadays that can easily be accomplished by importing it automatically from the more complete collections of the distributed Web. Recall also that universities are not the universal providers of all research output. There will always be independent scholars, as well as publications by authors in government, non-profits and think tanks, and corporations. The OA philosophy is global. It cannot be reduced to a single university. Update (2/6/09). [Peter Suber:] For my views, see points #3 and #13 in my article from last week on OA policy options. ...Gavin Baker suggests that it does not matter where authors deposit their papers to make them Open Access (OA): in an Institutional Repository (IR) or a Central Repository (CR). Nor, more importantly, does it matter where authors' funders mandate that they should deposit them, because IR deposits can be harvested to CRs and vice versa. I point out that this apparent symmetry between IRs and CRs with respect to the harvestability from one to the other (in either direction) is irrelevant today because most of the target content for OA is not yet even being deposited at all, anywhere: In other words, authors are decidedly not "just doing it." Nor are institutions -- the universal providers of OA's target output, both funded and unfunded, across all fields -- "just mandating that authors do it." Apart from the tiny number (about 30) that have already mandated deposit, institutions are the "slumbering giant" of OA, until they wake up and mandate the deposit of their own research output in their own IRs. Not all research output is funded, but all research output is institutional: Hence institutions are the universal providers of all OA's target content. Although not many funders mandate deposit either, the few that already do (about 30) can help wake the slumbering giant, because one funder mandate impinges on the research output of fundees at many different institutions. But there is a fundamental underlying asymmetry governing where funders should mandate deposit: As Prof. Bernard Rentier (founder of EuropenScholar and Rector of U. Li�ge, one of the first universities to adopt an institutional deposit mandate) has recently stressed, convergent funder mandates that require deposit in the fundee's own IR will facilitate the adoption of deposit mandates by institutions (the slumbering giant), whereas divergent funder mandates that require CR deposit (or are indifferent between CR and IR deposit) will only capture the research they fund, while needlessly handicapping (or missing the opportunity to facilitate) efforts to get institutional deposit mandates adopted and complied with too. The optimal solution for both institutions and funders is therefore: "Deposit institutionally, harvest centrally". Update. (2/10/09) [Gavin Baker:] See also my response to the responses. Posted by Gavin Baker at 2/06/2009 06:05:00 PM. Here are a few comments from the press and blogosphere on the re-introduction of the Conyers bill (a.k.a. Fair Copyright in Research Works Act, HR 801), which would overturn the OA policy at the NIH. ...[W]hile near-universal opposition to the bill remains�changes in the political and bureaucratic landscape could mean a tougher battle in 2009 for those opposed to the bill. Following last year's hearing, lawmakers all but ruled out action on the bill in 2008, saying the issues needed to be studied more. If the issues were studied more, however, it�s hard to tell. Not only was the bill reintroduced early in the 111th congress by Congressman John Conyers (D-MI), it was introduced without revision, despite extensive criticism and comment, and broad opposition from a range of stakeholders, including librarians, Nobel Prize-winning researchers, and a coalition of law professors and copyright experts. The NIH Public Access Policy is working. Although publishers have made vague assertions, claims that there are legal problems with the NIH policy have been discredited. Similarly, there is no evidence to support the policy - with its allowance of an unduly long 12 month delay - that scholarly communication in the biomedical sciences has been harmed. Indeed, it's really time to turn this conversation around. The United States' economy needs more than increased consumer spending to recover. We need to innovate, and innovation in basic research happens quicker and in more diverse directions in an open, networked environment. In a word, research should be linkable. Wanna see? Do you have breast cancer or is there a woman in your life who does? Want to know more about the statistical risks? Thanks to the NIH Public Access Policy, I can simply suggest that you click here because your tax dollars supported the study. So, Chairman Conyers, with all due respect, the policy question is not whether Congress should act to deny scientists and taxpayers access to research funded by NIH, but rather, why should NIH-funded research articles be the only articles reporting federally-funded research that scientists and taxpayers like me can link to? While there is lots of legislation that Public Knowledge disagrees with, we can often see the rationale for it. Not so with H.R. 801, the Fair Copyright in Research Works Act....This bill would have the effect of overturning the �open access� to research policy of the National Institutes of Health, which requires that research funded by the agency to be made available for free in an online archive within 12 months of publication. The rationale for this policy is simple - if taxpayers are going to pay for research, taxpayers should get a return on their investment by getting free online access to that research. This is the same rationale driving some of the conditions on the stimulus bills being debated right now - government can, and in this case especially should, put public interest conditions on the money it spends. So why would Rep. Conyers, considered a champion of the public interest, introduce this bill? News reports indicated that the Chairman was upset because he believed that the House appropriators seized what he believed to be a copyright issue from his Committee. Open access to government supported research is not only the proper response to ensure that taxpayers get a return on their investment, it is consistent with President Obama�s vision of greater public access to government information, more government transparency and increased accountability. Chairman Conyers and his House colleagues should not allow a jurisdictional dispute undermine these critical goals. ...Publishers...objected, viewing the policy as a threat to the value they could extract from copyrighted publications. Their objections, in part, eventually led to the introduction of a bill that would roll back the NIH policy, which allowed the House Judiciary Committee to hold hearings on it last year. Unfortunately for open access fans, this year's bill seems to present a greater threat to the NIH's policy. For one, Congress is distracted by other issues, which might allow a minor amendment to a funding bill to slip through unnoticed. In addition, Zerhouni gave a strong defense of the open access policy on scientific grounds at last year's hearings; he's since stepped down and, with Tom Daschle withdrawing his nomination, it's not even clear when a new head of Health and Human Services will be named; until that position is filled, there won't be a new NIH chief named. My own comments on the re-introduction of the bill, my comments on the first two press releases from the publishing lobby, and my analysis of the bill the first time around, which still applies in full since the the bill is unchanged. Our three collections of comments on the bill from the first time around (1, 2, 3). Posted by Peter Suber at 2/06/2009 01:39:00 PM. Posted by Peter Suber at 2/06/2009 12:35:00 PM. Kudos to all at the FRSQ. I applaud the mandatory language, the option to comply with the policy by publishing in an OA journal (alongside the option to publish in a TA journal and deposit in an OA repository), the encouragement for past grantees to comply with the policy, and the six month embargo. Note that FRSQ continues the pattern that every medical research funder in the world with an OA mandate, except the NIH, uses a six month embargo. Unfortunately the policy leaves a loophole for resisting publishers. (When grantees publish in a TA journal and deposit in an OA repository, they "must comply with the publisher�s...policies.") The loophole is not at all necessary, and has been closed in the policies of the Wellcome Trust, NIH, MRC, and many others. For details on how to close it and still ensure that the OA is authorized by the copyright holder, see #10 of my article from last week. Posted by Peter Suber at 2/06/2009 11:38:00 AM. The presentations are now online from the Data Library 25th Anniversary (Edinburgh, December 5, 2008). See also the detailed notes or blog post by Anne Donnelly. Posted by Gavin Baker at 2/06/2009 10:47:00 AM. The PARSE.insight project is conducting a survey of researcher practices and views regarding data re-use and preservation. ... The European Alliance for Permanent Access aims to work together to preserve research data for future re-use. Science and research publishers actively support and partake in the Alliance through the participation of the International Association of Scientific Technical and Medical publishers. A number of Alliance partners have initiated a project, partly funded by the EU, entitled PARSE.insight which aims to gain insight into the requirements of researchers, data managers and funding agencies with regard to preserving research data. PARSE.insight will help to shape the EU's preservation infrastructure, as part of the broader e-Research infrastructure, so that European citizens can continue to gain benefits from its digital resources, in all aspects of life. See also our past post on the PARSE.insight project. Posted by Gavin Baker at 2/06/2009 10:32:00 AM. Jos� Manuel Nieves, Un Consejo de Pol�tica Cient�fica controlar� la investigaci�n en Espa�a, ABC.es , February 5, 2009. Read it in the original Spanish or Google's English. Posted by Gavin Baker at 2/06/2009 10:18:00 AM. Posted by Gavin Baker at 2/05/2009 06:24:00 PM. Two publisher groups which supported the Conyers bill the last time around are supporting it again. No surprises here. Federal copyright law and years of precedent grant copyright owners control of the right of reproduction, distribution, and public performance and display. But in a troubling reversal of this incentivizing precedent, Congress � without consultation of members with expertise in copyright law � has given the federal government control over the reproduction and distribution of certain research works without regard to the rights of publishers. The mere fact that a scientist accepts as part of her funding a federal grant should not enable the federal government to commandeer the resulting peer-reviewed research paper and treat it as a public domain work. Both statements say or imply that the NIH policy violates publishers' copyrights. That is false. If it were true, or if the publishers honestly believed it to be true, they would be in court, where they would already have a remedy for copyright infringement. Instead, they are in Congress lobbying for this bill which would amend US copyright law. They must change the law to get what they want because the NIH policy does not violate current copyright law. Both statement say or imply that publishers are the copyright owners, without qualification, on the articles reporting the results of NIH funded research. That is false. The NIH policy requires grantees to retain a key right and use it to authorize OA. There are three important consequences: (1) OA from the NIH is authorized by the copyright holders, (2) NIH-funded authors no longer transfer the full bundle of copyrights to publishers, and publishers no longer acquire the full bundle of copyrights on these articles, (3) publishers acquire fewer rights from authors than in the past, but have undiminished power to enforce the rights they do acquire. The rhetoric that the policy "commandeers" publishers' articles or forces publishers to "surrender" their articles is false. It suggests that these articles are publishers' property, without qualification, and the NIH somehow expropriates their property or prevents publishers from enforcing their rights. But see the previous bullet: publishers are not the full owners of these articles, and they remain free to hold all the rights they acquire and to enforce all the rights they hold. Perhaps I should also add that US copyright law protects the right of authors to divide the bundle of copyright and transfer some rights, rather than all rights, to a publisher. It's true that publishers invest money in organizing peer review. But the commandeer/surrender rhetoric implies that they discover, after the fact, helplessly, that the NIH will distribute OA copies of the peer-reviewed manuscripts. That is false. When NIH-funded authors approach publishers, they don't merely ask "will you publish my article?" but also "will you publish it under these terms?" It's a business proposition that publishers may take or leave. Publishers are virtually unanimous in taking it. But in these public statements they pretend that the government is taking their property and suppress the fact that they accept the offer with their eyes open. The publishing lobby and Rep. Conyers are unhappy that the original policy was adopted without consulting the House Judiciary Committee, which vets new bills raising copyright issues. It's true that the Judiciary Committee was not consulted. While that may have created a regrettable turf battle among House committees, there ought to be a way to resolve it without distorting the facts or enacting bad policy. The NIH policy does not violate copyright law. Don't take my word for it. Read the judgment of 46 copyright lawyers. Pretending that the policy violates copyright in order to justify review by the Judiciary Committee does nothing to clarify the committee's jurisdiction or respect its expertise on copyright issues. While the original policy was adopted without consulting the Judiciary Committee, the Judiciary Committee has since held a hearing (September 11, 2008) on the issues raised by the policy and by this particular bill to overturn it. The no-consultation objection is now moot. Continuing to press the point puts the turf war ahead of the public interest in good policy. Bypassing the Judiciary Committee the first time around was not a stealth maneuver. William Patry, former Copyright Counsel to the House Judiciary Committee, says it's "absurd" to think that the NIH policy raises copyright issues or that it had to be reviewed by the Judiciary Committee. For a more detailed analysis of all of these points, see my article from last October on the Conyers bill and the rhetoric of the publishing lobby. Posted by Peter Suber at 2/05/2009 03:08:00 PM. Open Access (OA) does not mean only, or mainly, open-access journals ("Gold OA"). The other, more widespread way to provide OA is for the authors of articles published in non-OA journals to make them OA by depositing an electronic version in an OA Repository ("Green OA"), thereby making them free for all (including those whose libraries cannot afford a subscription) -- as 34 research funding councils worldwide (including all the UK Research Councils, the European Research Council and the US National Institutes of Health) as well as 31 Universities and Faculties (including Southampton, Glasgow and Stirling in the UK, and Harvard and Stanford in the US) have already adopted mandates requiring the authors they fund and employ to do. Posted by Peter Suber at 2/05/2009 01:58:00 PM. Research Council of Norway adopted 28 January principles for open access to scientific publications. Research will require that the articles that are a result of funding from the research, should be made available through self-archiving or Open Access publishing to the extent not in conflict with the publishing rights. Also see our past posts on the consultations leading up to the NRC policy. Update (2/6/09). The Norwegian Research Council has released an announcement and the text of the policy. (Thanks to Jan Erik Frantsv�g.) Both are in Norwegian. Because the policy is a PDF, I can't link to a machine translation. The announcement is in HTML, but for some reason Google Translate chokes on it at the moment. Here's the link to Google's English in case the problem is merely temporary. Update (2/18/09). Stian H�klev has translated the key parts of the new policy. Posted by Peter Suber at 2/05/2009 12:50:00 PM. An "open-access" future for academic publishing would save money while boosting the profile of research and maximising its economic impact, a study has found. The Jisc study looked at three models of scholarly publishing: subscription access, where readers are charged and the use of material is restricted; open access, where access is free and publication is funded from the author's side; and open access self-archiving, in which authors post their work in online repositories, making it free to all via the internet. "When you consider that (more than �20 billion) a year is spent on research and development in the UK, it would be useful if we knew that we were getting value for money. We have a traditional publishing model based on copyright, principally involving journals, books and databases, and the reader is charged to access it. At the other end, the Government is putting in huge amounts of taxpayers' money to achieve a public good, so the country is supposed to get something out of it. These two things seem to me to be contradictory: public money is being put into research, but then the people are being stopped from accessing it," [Houghton] said. Professor Houghton added that the current model operated by journal publishers was "unsustainable", not least because of the ever-increasing subscription charges faced by universities. And he noted that researchers would benefit from the wider dissemination of their work, too. "There's a proven citation advantage of open-access publishing: you get more readers, you get a better range of them, and that should help you get more funding." While acknowledging that there would be costs involved in reshaping the publishing landscape, Professor Houghton said the Jisc analysis suggested that they would be affordable within current budget allocations, and that the long-term savings would be significant. PS: See our post on the latest Houghton study and all our past posts on his research on the economic impact of OA. Posted by Peter Suber at 2/05/2009 08:10:00 AM. Access to and use of Unlocked articles are covered by the terms and conditions of the exclusive licence agreement, which specifically prohibits commercial use of these articles. Authors participating in Unlocked are able to place the full final version of their article in the depositories of their choice. BMJ Journals will deposit all Unlocked articles in PubMed Central immediately on final publication. Posted by Peter Suber at 2/04/2009 09:38:00 PM. Bioalma, the Spanish biomedical IT/text-mining company, has launched a free search tool for the PubMed literature database called novo|seek, which the company claims provides intelligent search functionality to help life scientists guide and refine their searches of the biomedical literature. The first release of novo|seek focuses on PubMed, but in time Bioalma plans to integrate additional resources, such as grant information and full-text search. Posted by Gavin Baker at 2/04/2009 07:37:00 PM. In addition BASE is still the only search engine for OAI Metadata which works with cross-language retrieval. The Eurovoc Thesaurus enables you to search a term in up to 21 languages not matter which language you use. There are 6,500 basic terms for every language, all in all 239,000 terms are included in the thesaurus. See also our past posts on BASE. Posted by Gavin Baker at 2/04/2009 07:32:00 PM. Update. P.S. The tool is a Google Custom Search Engine. Posted by Gavin Baker at 2/04/2009 07:04:00 PM. ARL Digital Repositories Task Force Releases Final Report, press release, February 3, 2009. The Association of Research Libraries (ARL) Digital Repository Issues Task Force has released its final report. The task force was charged with evaluating trends, contextualizing repository activities among ARL libraries, and recommending leadership roles and activities for ARL. Build a range of new kinds of partnerships and alliances, both within institutions and between institutions. Base service-development strategies on substantive assessment of local needs rather than blindly replicating work done at another institution. Engage with key local policy issues and stakeholders to encourage institutional engagement with national and international policy issues. Develop outreach and marketing strategies that assist �early adopters� of repositories to connect with the developing repository-related service system. Posted by Gavin Baker at 2/04/2009 07:00:00 PM. Primary Prevention Insights is a new OA journal published by Libertas Academica. See today's announcement or the inaugural editorial. The article-processing charge is $1395, subject to discount or waiver. Articles are published under the Creative Commons Attribution License. Posted by Gavin Baker at 2/04/2009 06:47:00 PM. Christian Zimmermann, RePEc in January 2009, The RePEc Blog , February 3, 2009. The big news this month is that we have now surpassed 700,000 bibliographic items listed in RePEc. The last 100,000 additions took only 7 months, something that seems difficult to beat. ... [W]e experienced heavy traffic on our sites, with 766,586 file downloads and 2,756,978 abstract views in January 2009. Posted by Gavin Baker at 2/04/2009 06:34:00 PM. A Nobel Prize-winning cancer biologist, leader of major scientific institutions, and veteran of science policy wars reflects on his remarkable career. An English major with a year of graduate studies in literature at Harvard University, Harold Varmus discovered he was drawn instead to medicine and eventually found himself at the forefront of cancer research at the University of California, San Francisco. In this warm, engaging memoir, Varmus considers a life's work that thus far includes not only the groundbreaking research that won him a Nobel Prize but also tenure as the director of the National Institutes of Health and his current position as president of Memorial Sloan-Kettering Cancer Center. Varmus also shares his perspective from the trenches of politicized battlegrounds ranging from budget fights to stem-cell research, global health to science publishing. Beyond evidence of Varmus's penetrating intellect, self-deprecating humor, and the deep joy he takes in science, The Art and Politics of Science offers a stimulating reminder to people in all walks of life about the fascinating--and central--role of science in our world. Posted by Gavin Baker at 2/04/2009 06:24:00 PM. Sparky Award Winners Announced, press release, February 3, 2009. The winners were announced on January 24 at a public screening held in connection with the American Library Association Midwinter Conference in Denver. The videos will also be screened at the Campus MovieFest Southern Regional Grand Finale in Atlanta March 28 and 29, 2009. Developed by SPARC, the Sparky Awards is co-sponsored by the Association of College and Research Libraries, the Association of Research Libraries, Campus MovieFest, the University of Pennsylvania Libraries, Students for Free Culture, and The Student PIRGs. The Grand Prize Winner will receive $1,000 plus a Sparky Award statuette. The two Runners Up each receive $500. All the winners will receive a copy of Freedom of Expression�: Resistance and Repression in the Age of Intellectual Property , a documentary film by Kembrew McLeod that looks at free speech and fair use. Posted by Gavin Baker at 2/04/2009 06:10:00 PM. PS: Storch doesn't mention OA. Posted by Peter Suber at 2/04/2009 03:14:00 PM. A large-scale effort to digitize library and related cultural-memory holdings would be an effective response to the mounting problems that challenge America. Beyond retraining workers for technology jobs, such a project would bring high-quality historical, scientific, and cultural materials into every home and workplace. That increased access would give businesses, state and local governments, and job seekers a leg up and would enrich education at all levels by bringing the world's collective knowledge to parents, teachers, and students. But a digital library for the new millennium should reach beyond books. Consider the value of giving every citizen free access to course materials....Add to those materials all the nonclassified studies emerging from government agencies and the results of scientific research conducted at universities and institutes. At the current pace, it would take generations to bring entire libraries and other cultural-memory collections to the open Web. But with an injection of funds, the rate could be quickly increased. On the basis of current practices, we know that in short order, up to 10,000 people could be trained and put to work scanning books, manuscripts, journals, and other materials in library collections. If the scanning encompassed materials outside of libraries, that number would soar. To create an open, universal digital library of 10 million books would require $300 million....That is a small price compared with the costs of many worthy public-works projects being contemplated....By financing it, President Obama and Congress would put Americans � and knowledge � to work. Generations to come will thank them for their foresight. PS: This article is adapted from a piece Lowry co-wrote last month with Prue Adler, Establish a Universal, Open Library or Digital Data Commons. For similar arguments that OA projects should be part of an economic stimulus, and could themselves trigger further economic recovery, see Michael Geist's article from January 2009, the Open Access Working Group proposal from January 2009, and my open letter to the next US president from October 2008. Posted by Peter Suber at 2/04/2009 02:58:00 PM. ...[NAGARA Resources is] an online document library which allows users to share archives and records management publications . Subject categories include: accessibility, advocacy, electronic records, disaster preparedness, electronic records, facilities, files management, grants, historical records, inactive records, local government records, microfilm, preservation, legal issues, retention, scanning & digitization, security, storage, training, and miscellaneous....[T]he library currently houses nearly 300 documents and expands in content almost daily. As content grows, site administrators will add new subject categories and/or subdivide existing categories. No registration is required to download documents , however users who wish to upload documents must be registered....Only documents in the public domain may be uploaded on this site, or copyrighted documents posted by the owner of the copyright. The site was built in partial response to a 2008 recommendation of the Council of State Archivists' "Closest to Home" Task Force on Archival Programs for Local Governments to "develop a coordinated plan for a portal to provide access to web-based resources on local government archives," but as content expanded, the site has proven to be of interest to archivists from other fields as well. Posted by Peter Suber at 2/04/2009 02:35:00 PM. Until today, the great libertarian journal Reason Papers (founded by libertarian icon Tibor Machan) maintained a two-issue moving wall before posting its print articles online. As of today, that changes. The editor, Aeon Skoble, has heroically decided to put all content online as soon as it's published. Issue No. 29 (Fall 2007) has been put online tonight [2/2/09] (the Reason Papers site is hosted by the Mises Institute, natch). Issue No. 30 should be out soon. PS: Just 10 days ago libertarians launched a new OA journal, Libertarian Papers. Posted by Peter Suber at 2/04/2009 12:36:00 PM. Posted by Peter Suber at 2/04/2009 12:27:00 PM. Yesterday Rep. John Conyers (D-MI) re-introduced the Fair Copyright in Research Works Act. This year it's H.R. 801 (last year it was H.R. 6845), and co-sponsored by Steve Cohen (D-TN), Trent Franks (R-AZ), Darrell Issa (R-CA), and Robert Wexler (D-FL). The language has not changed. The Fair Copyright Act is to fair copyright what the Patriot Act was to patriotism. It would repeal the OA policy at the NIH and prevent similar OA policies at any federal agency. The bill has been referred to the House Judiciary Committee, where Conyers is Chairman, and where he has consolidated his power since last year by abolishing the Subcommittee on Courts, the Internet, and Intellectual Property. The Judiciary Committee does not specialize in science, science policy, or science funding, but copyright. The premise of the bill, urged by the publishing lobby, is that the NIH policy somehow violates copyright law. The premise is false and cynical. If the NIH policy violated copyrights, or permitted the violation of copyrights, publishers wouldn't have to back this bill to amend US copyright law. Instead, they'd be in court where they'd already have a remedy. For a detailed analysis of the bill and point by point rebuttal to the publishing lobby's rhetoric, see my article from October 2008. Posted by Peter Suber at 2/04/2009 11:54:00 AM. Opus is an Online Publications Store, or repository that collects and hosts the research publications of University of Bath authors. Describing the service as a way to enhance the visibility of Bath publications, [Professor and Pro-Vice-Chancellor for Research Jane Millar] emphasised that the transfer of knowledge and the impact of our research is essential for the University, to its community and collaborators. Using the Eprints repository software, Opus is based on international standards that make it easier for search services such as Google to find and harvest publication details. Opus also hosts the University of Bath PhD and research degree e-theses, and participates in the British Library Ethos service for improving access to research theses in the UK. As well as encouraging authors to upload their research publications to Opus, Research Publications Librarian Kara Jones also outlined the assistance available to Bath researchers. This includes training to use Opus to store publications, information on document versions, and alternatives to Copyright Transfer Agreements from publishers. The aim, she said, was "to give both authors and publishers the rights needed to maximise the dissemination and communication of research publications". Posted by Peter Suber at 2/04/2009 10:39:00 AM. Paula J. Hane, Open Solutions for Libraries Gain Momentum, Information Today , February 2, 2009. Posted by Gavin Baker at 2/03/2009 05:38:00 PM. New technologies offer ordinary citizens a vast range of new opportunities to speak, create and publish; they decentralize control over culture, over information production and over access to mass audiences. But these same technologies also make information and culture increasingly valuable commodities that can be bought and sold and exported to markets around the world. These two conflicting effects- toward greater participation and propertization - are produced by the same set of technological advances. Technologies that create new possibilities for democratic cultural participation often threaten business models that seek to commodify knowledge and control its access and distribution. Intellectual property and telecommunications law may be the terrain on which this struggle occurs, but what is at stake is the practical structure of freedom of speech in the new century. Posted by Peter Suber at 2/03/2009 05:31:00 PM. Jonathan Miller, Blogging from Midwinter -- 2, The Director's Blog , January 24, 2009. Notes from the American Library Association Midwinter Meeting (Denver, January 23-28, 2009) on SCOAP3 and OERs. Posted by Gavin Baker at 2/03/2009 05:23:00 PM. Tom Daschle has withdrawn his name from consideration as Barack Obama's Secretary of Health and Human Services. He was expected to be confirmed by the Senate, but damaged by his failure to pay $140,000 in personal income tax until after Obama nominated him. More coverage. Daschle is a former Senator from South Dakota (1987-2005), former Senate majority leader (2001-2003), and co-author of a book on reforming the US health care system. As far as I can tell, he had no public track record on OA issues. The OA connection: The National Institutes of Health (NIH) belongs to the Department of Health and Human Services (HHS), giving the next HHS Secretary significant control over the future of OA in the US federal government. The position of NIH Director is also vacant and will probably remain vacant until we have a new HHS Secretary. Stay tuned. Posted by Peter Suber at 2/03/2009 05:20:00 PM. The OA working group of the Library Commission of the Conference of Italian Rectors has released its comments on the European Commission's green paper, Copyright in the Knowledge Economy. See also our past posts on the green paper. Posted by Gavin Baker at 2/03/2009 04:57:00 PM. FLOSS+Art is an OA book released in late 2008; the OA edition can be downloaded from The Pirate Bay. FLOSS+Art critically reflects on the growing relationship between Free Software ideology, open content and digital art. It provides a view onto the social, political and economic myths and realities linked to this phenomenon. Posted by Gavin Baker at 2/03/2009 04:33:00 PM. Posted by Gavin Baker at 2/03/2009 04:25:00 PM. Jo Cook, On being open and what that means, Computing, GIS and Archaeology in the UK , January 29, 2009. ... �Open Archaeology� comprises three strands: open standards, open access, and open source. We see this as the only logical way of fulfilling our remit as a commercial archaeological organisation, and an educational charity. Our job is to record the cultural remains that are damaged or destroyed by development. Our remit is to make those records available in perpetuity, to anyone who wants to see them. At the end of the day, pretty objects in museums are of little use without the background information that gives them context and fires the imagination. Posted by Gavin Baker at 2/03/2009 03:54:00 PM. Alexandria Archive Institute, AAI announces winners of the 2008 ASOR Open Archaeology Prize, press release, January 30, 2009. Posted by Gavin Baker at 2/03/2009 03:44:00 PM. Each contains conference presentations by researchers in the respective section of the �cole pratique des hautes �tudes. The 2006-7 issues are now online. Posted by Gavin Baker at 2/03/2009 03:33:00 PM. Economists Online went on air on 2 February 2009. This is a cross-searchable portal with a focus on quality economics research results. It includes profiles of hundreds of leading authors and their comprehensive publication lists with links to many full texts free of charge. Over 300 researchers from 6 top economics institutions (The London School of Economics, Tilburg University, Erasmus University Rotterdam, Maastricht University, Universit� Libre de Bruxelles and Katholieke Universiteit Leuven) are currently feeding this first phase of the service. Feedback from the NEEO project participants and their researchers will be considered for the design of the next version of the service. The public can expect access to the second version, which will cover access to the direct research results of over 800 researchers in some 20 prestigious economics institutions (e.g. the universities of Oxford, Warwick and Carlos III Madrid) in autumn 2009. See also our past posts on Nereus. Posted by Gavin Baker at 2/03/2009 01:53:00 PM. Does your field of study depend on public-domain records which are not yet digitized or OA? A lot of us have a lot to learn from the genealogists. PS: Also see our past posts on OA to genealogical information. Posted by Peter Suber at 2/03/2009 01:23:00 PM. Ideal state: There is widespread access to publicly funded research data, with appropriate mechanisms in place for regulating access that takes into account security, ethical, legal, and economic interests where appropriate. There are large reservoirs of existing data not in current use and not available online. Researchers are reluctant to share data because they feel it is their intellectual property. Researchers lack the expertise to ensure that data are accessible by others in the future. While there is a growing international trend towards free access to data held in repositories (e.g. GeoConnections), many repositories still charge fees for access...or restrict access to community members only (e.g. Statistics Canada and Natural Resources Canada). Comment. The Working Group turned off cutting and pasting in the PDF report. (Why?) Normally under these circumstances I'd point you to the relevant pages and not bother to rekey an excerpt. But the Working Group didn't paginate the report either. (Why?) This not a good sign of how well the Working Group understands the gap between the current state and the ideal state of information sharing. Update (2/4/09). Kathleen Shearer, the lead author of the report, has unlocked the PDF and added page numbers. Thanks, Kathleen! Posted by Peter Suber at 2/03/2009 01:04:00 PM. Michael Heller, a property lawyer at Columbia University, has coined the term the 'tragedy of the anti-commons'....Heller's insight is that too much private ownership can be as much of a problem as too little: �When too many owners control a single resource, cooperation breaks down, wealth disappears and everybody loses.� He gives plenty of examples in his book The Gridlock Economy -- the book's argument is forcibly stated in its subtitle: How Too Much Ownership Wrecks Markets, Stops Innovation, and Costs Lives. Google is already serving a very different and vastly narrower view of Google Book Search to the rest of the world (even to Canada and Mexico). Books which are public domain and wholly visible and readable in the US are not visible or readable elsewhere. And this copyright caution about territorial rights is unlikely to change, because the Settlement, when it is approved, is only going to be approved and agreed for the US market. Google has been persuaded (or has volunteered?) to accept the territorial restrictions and complications inherent in the market of copyright books. In my view, Google will not risk starting court actions in other jurisdictions, for the very simple reason that they might be lost, or worse still settled on a different basis from the US dispute. Google will be bound to leave the ex-US position of its wonderful aggregate of unloved (mostly 'orphan') copyrights in a national limbo. The orphans will remain unloved outside the 50 states. PS: See our past posts (1, 2, 3, 4, 5) showing that Google Book Search already tends to block access to users outside the US. Posted by Peter Suber at 2/03/2009 12:35:00 PM. Is Yemen about to mandate access to research? The Yemen parliament is considering a bill to enhance citizen access to information. Most of it concerns public sector information and government sunshine practices. But it also touches on access to research. Parliament is scheduled to discuss the information draft law during its present legislative session, after it was passed at the meeting of the Council of Ministers, held last December, acting on a proposal made by the National Information Center (NIC). Comment. Unfortunately, the key paragraph is obscure. What does it mean to "put down copies of research"? Deposit them in repositories? Pull them off the internet? The general context suggests that access to research must be wider and easier, if not open. But the immediate context ("To ensure intellectual property rights...") suggests the opposite. Can any OAN readers help sort this out? If so, please drop me a line or post your findings or translations to SOAF. Posted by Peter Suber at 2/03/2009 11:51:00 AM. Posted by Peter Suber at 2/03/2009 11:04:00 AM. Abstract: The fundamental concerns about intellectual property for open access institutional repositories are not about who owns what rights, or who can do what with them, or what you have to require contributors to give your institution to be sure you�ve got the rights you need to provide open access to their works. Those guidelines are readily devised and applied. The copyright conundrum created by open access is more basic than this: Is it appropriate, is it even necessary, and certainly, is it the best way going forward, to artificially make our works difficult to find and access and saddle them with high prices in an era when people all over the world could quickly know about our current research results through the Web for no more than the cost to them of their own infrastructure to find and read our works? For more than 200 years copyright law has enabled, and scholars and their publishers have depended on, the mechanism of state-granted monopoly, "creating artificial scarcity" to give publishers a period of time during which they can charge higher prices than the market would otherwise dictate and recover their costs of publishing plus a profit in most cases. But today we have instant access to digital creative works, and easy, world-wide distribution for almost no cost for the reader beyond the cost of computers, internet access and electricity. In this world, the monopolistic mechanism of "artificial scarcity" turns what is one of the most important, most critical advantages of the digital world into something to be fought tooth and nail. The solution isn�t stronger and longer copyrights. It more likely will emerge from massive experimentation to find satisfactory business models that can fund the creation of works, still a costly undertaking, without sacrificing the digital benefit of relatively free distribution to anyone and everyone who might desire to access our works. Everyone in this room probably knows this. But what we may not realize is the magnitude of the experiment and what it also tests -- that if in fact it is not just possible but profitable to create and disseminate digital research results (or any creative digital work for that matter) without relying on the copyright monopoly, and if the social costs of monopoly begin to outweigh its public benefits in the coming world of ubiquitous repositories adding to ubiquitous Web content, all providing ubiquitous open access, the experiment tests the validity of the fundamental assumption underlying copyright, that monopoly is the only way (or even the best way) to achieve optimal production of most creative works. Posted by Peter Suber at 2/03/2009 08:42:00 AM. See also our past posts on Rentier or the Universit� de Li�ge, where he is rector. Update. 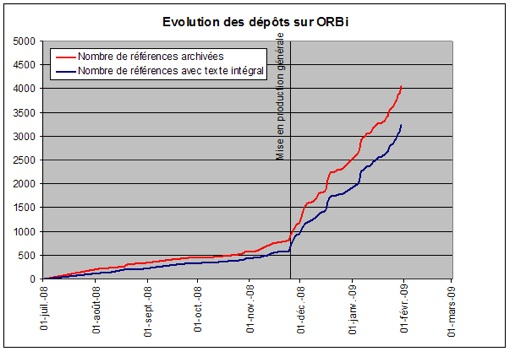 See especially this graph showing deposits (all deposits in red, full-text deposits in blue) before and after the repository went into general production, with its accompanying mandate. ... The latest [green OA] initiative comes from the very active EUROHORCs (European Association of Heads of Research Funding Organisations and Research Performing Organisations), well known for its EURYI prizes and its prominent influence on European thinking in the research area. EUROHORCs is working to convince the European Science Foundation (ESF) to set up, through a large subsidy from the EC, a centralised repository (CR) which would be both thematic (Biomedical) and geographic (European). The concept is inspired by PubMed Central, among others. The EUROHORCs initiative is very well-intentioned. ... But the initiative also reveals a profound misunderstanding about what OA and researchers� real needs are all about. Posted by Gavin Baker at 2/02/2009 08:48:00 PM. Rufus Pollock, Open Data Openness and Licensing, Open Knowledge Foundation Blog , February 2, 2009. It�s crucial because open data is so much easier to break-up and recombine, to use and reuse. We therefore want people to have incentives to make their data open and for open data to be easily usable and reusable � i.e. for open data to form a �commons�. See also our recent post on licensing and open science. Posted by Gavin Baker at 2/02/2009 08:28:00 PM. The Universidad Nacional Aut�noma de M�xico's humanities school (Facultad de Filosof�a y Letras) has launched a new IR, RU-FFYL, as part of UNAM's 3R project. See the January 31 announcement by Juan Manuel Zurita S�nchez in the original Spanish or Google's English. See also our past posts on the 3R project. Posted by Gavin Baker at 2/02/2009 08:22:00 PM. Joshua Ferraro, Beyond Open Source : Other Types of Open, Open Sesame , January 29, 2009. National libraries, and the Library of Congress, that create records and make them available freely via Z39.50 or on CD-ROM. These types of databases are openly-licensed in the sense that they are often public domain and free. However, the databases themselves are tightly managed in a top-down fashion, and often don�t contain metadata for many of the materials libraries own. Membership-driven organizations, consortia, and ILS vendors often provide subscription-based access to their comparatively large metadata databases, and let members add and maintain the database. This solves the community-maintained piece, but the underlying data is typically not available to non-members and is viewed as the intellectual property of the organization hosting access to the platform, rather than collectively owned by the users. John Mark Ockerbloom, Open catalog APIs and data: ALA presentation notes posted, Everybody�s Libraries , January 28, 2009. I�ve now posted my materials for the two panels I participated in at ALA Midwinter. I have slides available for �Opening the ILS for Discovery: The Digital Library Federation�s ILS-Discovery Interface Recommendations�, a presentation for LITA�s Next Generation Catalog interest group, where I gave an overview of the recommendations and their use. At the same session, Beth Jefferson of BiblioCommons talked about some of the social and legal issues of sharing user content in library catalogs and other discovery applications. And I have the slides and remarks I prepared for �Open Records, Open Possibilities�, a presentation for the ALCTS panel on shared bibliographic records and the future of WorldCat. In that one, I argue for more open access to bibliographic records, showing some of the benefits and sustainability strategies of open access models. Talis and LibLime Open Data on �biblios.net, press release, January 30, 2009. Talis, the UK market leader in providing academic and public library solutions, and LibLime, the leader in open solutions for libraries, are pleased to announce a partnership to make available over five million bibliographic records to the library community on the �biblios.net platform. �biblios.net is LibLime's free browser-based cataloguing service with a data store containing over thirty-million records. The database is maintained by �biblios.net and uses a similar model to Wikipedia. Cataloguers can use and contribute to the database without restrictions because records in �biblios.net are freely-licensed under the Open Data Commons Public Domain Dedication and License. Posted by Gavin Baker at 2/02/2009 06:42:00 PM. Yakov Shafranovich, Change in Google Book Search Guidelines for Public Domain Books, Personal Website of Yakov Shafranovich , January 30, 2009. [The guidelines have been changed] - it used to say that only non-commercial use is [allowed]. Now it has been replaced by two new guidelines: no hosting, and no reprints including helping people reprint. An interesting wrinkle about the new hosting restriction is that the Internet Archive is currently hosting about 537,000 PDFs of public domain books from Google Book Search. Under the old rules, non-commercial hosting was ok. What is the story under the new guidelines? See also the comments by James Grimmelmann and others. See also our past post on the Google Book Search guidelines. Posted by Gavin Baker at 2/02/2009 05:44:00 PM. PS: See our past posts on toll access for Catholic liturgical texts. Posted by Peter Suber at 2/02/2009 04:07:00 PM. annual workshops, one in each of EU, China, India, and Russia, which will also be webcast to facilitate greater access. Posted by Peter Suber at 2/02/2009 03:04:00 PM. 1) What are the most interesting innovations happening right now in the field of digital humanities, and is it possible to predict or anticipate what will be most important in the future? Now let's look at these three areas again (Access, Production, and Consumption) but in the context of humanities scholarship....The change in access may not be quite as far along as it is for music, but it will be soon. Like with music, you'll have access to materials from all over the world. You won't have to send a book via airmail from New York to Chicago because you'll have instant access to it on your PC (or your mobile device). If you want to study materials in China, you'll be able to view them (or for that matter, find out about them) using the Web. 4) How will digital technology in the academic system in general (for example, in the changing role of textbooks in the classroom, open-access databases, or publishing requirements for tenure) affect the way research is performed and shared? Posted by Peter Suber at 2/02/2009 01:16:00 PM. Abstract: This article introduces a novel element to copyright law's exemptions' scheme, and particularly the fair use doctrine --a reciprocal share-alike requirement. I argue that beneficiaries of a copyright exemption should comply with a complementary set of ex-post reciprocal share-alike obligations that come on top of the exemption that they benefit from. Among other aspects, reciprocal share-alike obligations may trump contractual limitations and technological protection measures that are imposed by parties who relied on a copyright exemption in the course of their own use of copyrighted materials. Thus, fair use beneficiaries should be obliged to treat alike subsequent third parties who wish to access and use copyrighted materials - now located in their new "hosting institution" - for additional legitimate uses. For example, if Google argues that its Book Project's scanning of entire copyrighted works are fair use, a similar exemption should apply to the benefit of future third parties who wish to use, for similar socially valuable purposes and under similar limitations, digital copies of books from Google's databases and applications. Google should also be prohibited from imposing technological protection measures and contractual obligations that revoke its reciprocal share-alike obligations. Similar quid-pro-quo schemes may apply in the context of content sharing platforms that initially rely on the Digital Millennium Copyright Act's (DMCA's) safe harbor for hosting services providers but later on impose proprietary restrictions on third parties who wish to reproduce and further use materials that were uploaded on the platform by end-users (e.g. as in the case of YouTube.com). And one could go on and apply this basic logic of a reciprocal share-alike quid-pro-quo on many other elements in copyright law's scheme of exemptions and limitations. I argue that the making of copyright's exemptions reciprocal corresponds well and improves the economics of copyright and public-welfare considerations. Overall, reciprocal share-alike exemptions structure copyright law in manner that strikes a better balance between copyright's contribution (incentive) to cultural production and copyright's social cost - the burdens it imposes on future creators. As long as a reciprocal share-alike requirement is structured in a scope that maintains enough incentives to produce secondary works, it represents a social benefit that copyright law should capture. In addition, the article argues that reciprocal share-alike exemptions further enhance democratic, autonomy and distributive values that underlie a public-oriented vision of copyright law. Posted by Peter Suber at 2/02/2009 01:03:00 PM. The recent revisions seem overall to support even more strongly expansive copyright and publisher's interests. The section on Europeana, which is new, has some pro-access language, but also points out that "protected works may not be digitised and made accessible, even in extract form, unless authorisation has been obtained from the rightholders" (emphasis added), a seeming swipe at Google Book Search. The EC's green paper, Copyright in the Knowledge Economy, is attached, but the suggestions of the many OA advocates who commented on the green paper appear to have had little influence on the report. Update. For additional background, see this post by Anne-Catherine Lorrain. Posted by Gavin Baker at 2/02/2009 11:43:00 AM. I just mailed the February issue of the SPARC Open Access Newsletter. This issue takes a close look at 18 choice-points facing funding agencies and universities when they draft a new OA policy, review an existing policy, or think about policies elsewhere. The round-up section briefly notes 159 OA developments from January. Posted by Peter Suber at 2/02/2009 11:04:00 AM. Posted by Peter Suber at 2/01/2009 08:11:00 PM.